Serialization & Customization - Flottman Company. The United States Federal Government and the European Union will be instituting track & trace compliance regulations for pharmaceuticals later this year. Flottman Company can support your pharmaceutical serialization requirements for all of your patient inserts. We are able to provide barcode serialization and coding with inline production. Sequential printing and database congruency will individualize each commissioned component with complete tracking documentation. Our 2D data matrix serialization barcode capabilities enable us to reconcile the insert, label or carton seamlessly to satisfy DSCSA compliance regulations. Our technology will allow you to track and trace your product throughout your distribution system. Along with Serialization of our miniature printed inserts, we also provide quantity and production line count certification. Our rigorous Standard Operating Procedures (SOPs) and Current Good Manufacturing Practices (cGMP) make it possible to deliver consistent and accurate counts across each production line. Flottman Company can create custom miniature printing and miniature folding pieces. It is best to include our design team at the beginning of your endeavor. Let our marketing team at FUSIONWRX craft the content and our design team at Flottman Company properly format and lay out the design of your miniature folding piece. We can assist you in creating the best informational insert possible and assure you that it will run and fold correctly on our machines. Contact our design team once your content is complete and allow us to model your miniature folded insert. Our print process enables us to print one- and two-sided inserts in black and white or 6+ color, and we can even add specialty inks. Whether you need your insert to contour to your packaging, become concealable behind your product or serve as a retail display cardback, Flottman Company can help. We can fold our inserts, outserts, RTAs and medication guides with as many as 238 informational fold panels, printed two-sided. Our max flat size is 28″ x 42″ and with various patterns can fold down to as small as 0.5″. Flottman Company offers a unique customization with ultraviolet light identification printing. The addition of invisible ink to our pharmaceutical and commercial folded printing projects differentiates us from the majority of our competition. The increase in counterfeiting threats in the pharmaceutical industry has amplified the need to add security features to packaging and accompanying literature. Our ultraviolet ink printing increases product tampering resistance. Flottman Company’s SecuRxperts Security Solutions includes ultraviolet visible ink printing as one of the multiple layers of security that we can add to your finished product. We can print logos, text, identification strips, color shifting barcodes and images that will only be visible under ultraviolet lighting. Our prevention solutions reduce the opportunity for fraudulent reproductions. We can include these attributes for serialization, corporate branding, barcode tracking, track and trace, serial number certification and verification. These materials can be linked to other variable and invisible ink components to establish Intelligent Packaging that will reconcile your complete packaging process from the miniature folded insert, to the label and the folding carton. 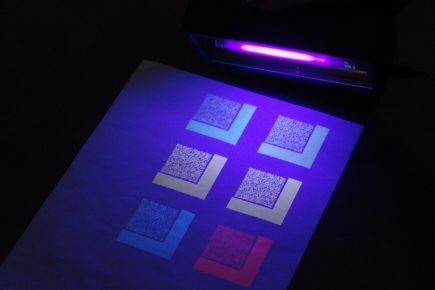 Ask how our ultraviolet visible ink printing can add another layer of security to your pharmaceutical, medical device, consumer packaging goods or your commercial printed materials.